When I went to grab my ORT jar for the picture, my daughter's Lil' Pony was on the same table...she likes to put her own "pretties" in there then bring it to me to see her handi-work. The fabric everything is sitting on is something I bought to work on a Christmas stitchy gift. We'll see if I ever get around to it! As I shared earlier, I've been sick for the past couple of weeks. I can't seem to shake this thing! So it absolutely made my dreary day when I received an email from Kate letting me know I won a $25 gift certificate to 123stitch.com for her Blogaversary! Visit her adorable site here: Momuboocrea Island and if you scroll through her posts to the one on 09/11/2012 you can listen to her cute audio blog! This also reminds me...don't forget to enter my Blogaversary contest as well...just click here! I hope everyone had a wonderful weekend full of family, fun and stitching! I'm off to check out all your updates! Congrats on your win:) Your stitching looks wonderful. congrats on the win, it came at the perfect time! You made so much progress, I bet you will meet your goal! I hope you feel better soon. Fantastic progress for IHSW. Great Tusal photo - I remember my little pony. Congrats on your win. 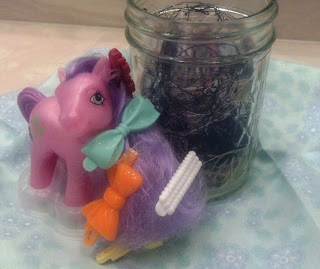 Aw I used to collect Little Ponies. Too cute. Love the fabric too. Sorry you haven't been feeling well. I was sick over a month with a stupid cough. Hope you get to feeling better soon! Love the piece your worked on. Wow what great progress. 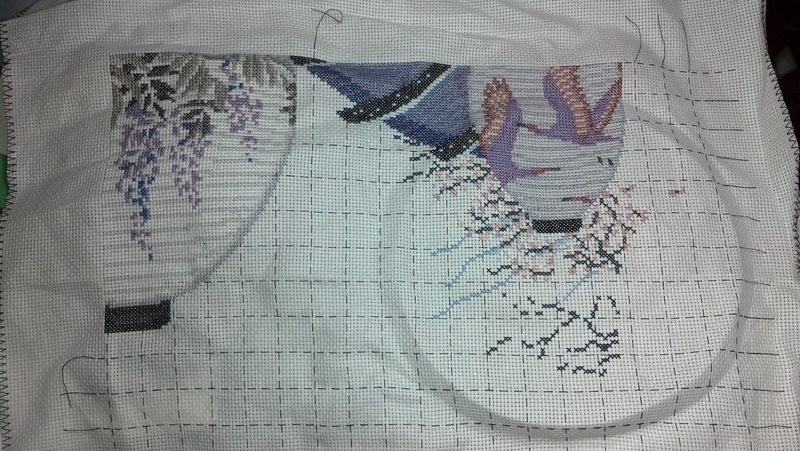 You always amaze me at how fast you stitch. Congrats on your win! Enjoy shopping. Lovely stitching and cure Orts ..
You did a lot of stitching , i love to see more. 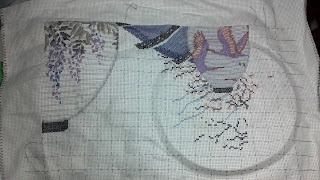 That is excellent progress - such a lovely pattern. Congratulations on your win. Hope you're feeling better soon. Wow you made HUGE progress at the weekend! Wow! You certainly got a lot done on Lanterns in just one weekend. 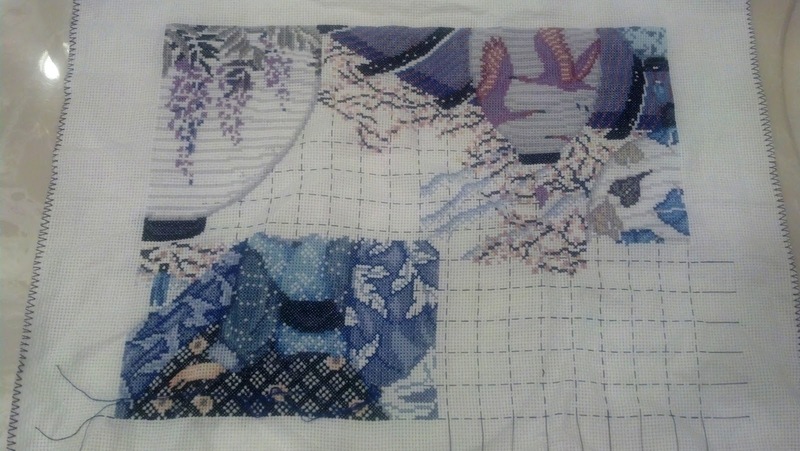 Amazing stitching! Congrats on your great win! Great progress for one weekend!! :D Uhuuuu! You did great! Big congrats on your win Lesli!! Kate is a sweetie and I loved her live blog post! Oh squeee!! My little pony!! I had toooons of those growing up then my mom threw them out :( I wished she kept them for me...oh well. Amazing amount of stitching you got accomplished...sorry if you were sick but wow!! It's looking fabulous! Holy moly, Lesli!!! I literally did a double take on Lantern. You got SOOOOOOOO much done!!!!!!! You can meet you goal!!! You have a whole week to go still. :D Can't wait to see. Wow! That latern piece is stunning!!!!! Beware of cheap imitations that are sold over the internet. Many claim that taking Hoodia does not help you to lose weight. A lot of people or dieters are turning to this diet pill in order to avoid the obesity related illnesses such as cancer, kidney failure, type 2 diabetes, hypertension osteoarthritis, atherosclerosis, and heart disease. substantial side effects of any diet is lack of energy.